Carmel Harrington’s Every Time A Bell Rings was one of my top reads of 2015 – yes I’m still going on about it! It was a story I thought was beautifully told and which really touched me. You can read my review of that here. 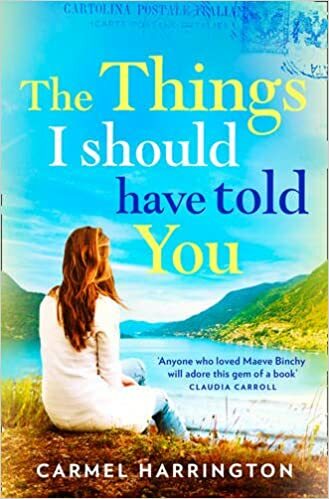 Her latest novel, The Things I Should Have Told You, is just as wonderful and I am sure it will be in my top reads of this year when I come to make up my list. The Guinness family are in crisis: 13 year old Evie has nearly died following a reckless dare, Pops is dying of cancer and Olly and Mae just don’t seem to communicate any more. Young Jamie too can sense the stressful situations all around him. But Pops has a plan to bring his beloved family together and plans an amazing trip round Europe for them to enjoy after he’s gone. The family are less than impressed to find out about this when they return from his funeral to find a campervan parked in their driveway! I just loved following the Guinness family on their adventures, rather reluctantly undertaken at first it has to be said. I think that spending 8 weeks in a campervan would challenge any family, let alone one with their various issues and problems! Although Pops isn’t around, he is a huge presence in the story through his letters. Like the family, I looked forward to reading them to see what wise words he would have and where they would be going next. It was such an amazing thing for him to do for his family, to try to make sure they would be a strong supportive unit after he’d gone. I do think Carmel’s books should come with a packet of tissues attached to the front cover because she has an amazing knack of making you feel all the emotions along with her characters! Yes there were tears and a lump in my throat at various points in the book, most notably when the family visit the American War Cemetery in Normandy and when Evie revealed the troubles she had been having a school. I so wanted to give her a hug! But there were so many happy moments too that tissues could be just as handy for wiping away happy tears. Or tears of laughter as the warm Irish humour comes through! So as you’ve probably gathered, I just adored this book and can’t recommend it highly enough. Carmel Harrington is definitely one of my go to authors when I want a story that will me me laugh, cry and smile and leave me with a happy glow. As one of the cover quotes says it’s a real ‘hug of a novel’. I really am thrilled to be able to share a guest post which Carmel has written specially for the blog. I’m not sure how my family would cope spending eight weeks in a campervan like the Guinness family! In her guest post, Carmel reveals what she likes to do when travelling with her family. The Things I Should Have Told You tells the story of The Guinness Family, who spend eight weeks travelling around Europe, in a camper van.The family are all under stress and as a result, none of them are the best versions of themselves. But travel is one of the only things that you can buy, that will make you richer. With each country they visit, each start to see the world, themselves and each other with fresh eyes. I’ve done a lot of travelling myself and many of the life lessons I picked up are wrapped up in their journey of self discovery. One of my favourite things to do when I visit a new country, is to have a courageous palate. Whether I’m travelling in Europe or further afield, I endeavour to always undertake a culinary adventure! It’s such a privilege to travel, not afforded to all. When in a new culture, I like to embrace as much of it as I can. In The Things I Should Have Told You, there’s an episode I like to call #ChipGate, that happens as a result of Mae asking her family to adopt this philosophy. You’ll have to read the book to find out exactly what that’s about. An easy way to do this, is to simply ask your waiter or waitress to recommend a local dish for you to try. My rule of thumb is – one new dish per country – at least! Sometimes it works out beautifully and I end up feasting on something so delicious it becomes a firm favourite of mine. And in truth, sometimes I end up pushing food around my plate and ordering an extra large dessert to make up for my disastrous pick! My family are on board too – almost. Amelia loves trying new things, as does my husband. But my five year old son Nate is proving to be a tricky one – his palate insists on waffles and sausages! He’ll get there in his own good time. Wherever you travel in 2017, boldly go folks. Boldly go. Thanks for that post Carmel and thank you to Jaime Frost at Harper Collins for my copy of the book. It is available now in ebook and as a paperback. You can order a copy online here.